This article provides financial and IT managers with an overview of dashboards and scorecards: their benefits, strengths, and integration. It gives guidance on when to implement dashboards and/or scorecards based on the evolving strategy execution and management reporting requirements. It is difficult to make decisions. We are tracking too many financial measures that are not strategic. We cannot deliver on long-term plans. We need to respond faster to market changes and competitive pressure. Strategic vision has little or no impact on the actions carried out in the business units. We need greater control over strategy execution. Strategy does not drive budgets. There is no accountability and confidence in long-term plans. Indeed, organizations are faced with new challenges, demands and competitors. Therefore, as the markets change and evolve, organizations are continuously looking at using new methods and tools to help them adapt, thrive in the current competitive environment, and execute effectively and efficiently. Due to the increased public requirements for accountability, non-profit organizations are also looking at performance improvements and cost-cutting methods. Performance transparency coupled with social and environmental regulations, declining resources, volatile funding, outsourcing, and multi-modal investments complicate their efforts in trying to improve their deliverables. To meet and exceed new market demands and to fulfill the increased accountability requirements, new software solutions have been developed. These new technologies integrate leading business and financial management applications with broad reporting and analysis functionality, delivering one, consistent user view to reduce costs and increase productivity. This emerging category of software applications enables companies to translate strategies into plans, monitor execution, and provide insight in order to manage and improve financial and operational performance. At Hyperion, we call these technologies Business Performance Management (BPM), a solution that has been validated by analysts and clients alike. The industry is also using equivalent terminology, such as Corporate Performance Management (CPM), or Enterprise Performance Management (EPM). Dashboards and scorecards are key components of a BPM solution today, and here is a quick overview of what they stand for. Dashboards are a style of interactive user interface designed to deliver user-specific information relating to the health of the business, typically represented by key performance indicators (KPIs) and links to relevant reports. Visual cues, graphs, and process controls focus user attention on important trends, changes, and exceptions. Dashboards expand the traditional needs of management reporting from static reports to an exponential growth in analysis options. Each employee in the organization can easily build and consume the information in their own dashboard and review business results through guided personal navigation. Management and executives can review operational and strategic information and understand the health of their business by having a combined view of their strategy, targets, and current results. Historically, dashboards focused on presenting the latest financial and operational information to all the users in the organization. Quick access was supported by drill-down capabilities for determining the root cause of a problem. Dashboards supported a reactive process by enabling any user to easily answer the question: Why did I miss my goal?. With the emergence of scorecards, dashboards have now transformed into more of a visual representation of any type of information (real-time or strategic), integrating easily with other applications and supporting all management processes. Dashboards are personalized, adaptive, graphical displays of tactical metrics that provide executives and key decision makers with a relevant overview of drillable data, with immediate clarity on the state of the business as appropriate to the individual�s role. Because they are cascading and connected, dashboards guide the navigation through the information from summary levels in an iterative fashion and quickly prioritize the actions required to improve business performance. They are also a definitive, self-service source of management information with a consistent view into metrics. Dashboards enable users to quickly respond to business dynamics. They have a unified point of view for financial reports and operational trends connected with both key performance indicators (KPI) as well as forecasting capabilities. Managers can use dashboards to adjust operating activities to minimize the impact of performance and quality versus plans and forecasts through an interactive interface with compelling graphics and charts. Dashboards can be viewed at all times, even when off-line. While dashboards are highly customizable tools, scorecards take a more structured approach. Scorecards systematically funnel and synthesize the vast quantities of dynamic enterprise activity-generated data into manageable amounts of clear, actionable insights, based on pre-defined management methodologies (Balanced Scorecard, Economic Value-Add, Six Sigma, etc.). They represent the center point of a strategy management system. Scorecards provide a visual grouping of KPIs relevant to individuals, departments, business units, or strategic objectives, focusing on future, strategic business goals. These indicators are related to the different priorities that the organization is focusing on, for example, financial, operational, customer, or quality. From the data perspective, scorecards align metric actuals with short-term and long-term goals. They can also incorporate company and industry performance benchmarks and risk factors. As an example, a scorecard can be based on the Balanced Scorecard � framework with the pre-defined perspectives: financial, customer, internal, and learning and growth (see Figure 1). The metrics on this scorecard are tied to a particular business unit, department, individual, or strategic objective. Having an owner for the scorecard ensures accountability, and having goals and benchmarks supports on-time delivery. This visual grouping of measures that represents a scorecard is the mechanism to communicate the organization�s goals and monitor performance. The scorecard allows a user to easily and pro-actively answer the question: �How does my goal support the corporate strategy?� It also ties into a process where each of the measures can trigger an e-mail alert when results are not in the expected range or when actions or initiatives are overdue, all in a collaborative environment supported by notes and discussion forums. But the most important � the most critical � aspect is that scorecards are the core component of a strategy management system. They support the strategy management process, from communicating the strategic objectives to defining actionable, result-oriented tasks. Features, such as e-mail alerts, notes, and discussion threads, support the necessary collaboration for driving consistency on financial and operational goals. Dedicated out-of-the box frameworks support any strategy management cycle, from those organizations focusing on shareholder value or quality initiatives, to those with a more balanced strategy, looking at all aspects of the organization, from financial and customer, to internal and learning and growth. While the collaboration aspects of a strategy management system are important, they need to be complemented by a range of reports. Management reports need to cover strategy, accountability, cause and effect topics, active initiatives, and metrics status to provide users with a comprehensive view of the organization, and to facilitate strategy monitoring and execution. For executives, the strategy management system provides specific views that support regular strategy meetings, incorporating actuals with targets, initiatives, and trends, to ensure corporate goals are aligned with business unit objectives. How many times have we tried to balance long-term, corporate, revenue goals and short-term, cost cutting measures? How many times have we seen corporate goals ignore business unit objectives? The strategy maps and executive reports show in a single view all objectives: strategic and operational, and their dependencies. This information bridges the communication gap between corporate and business units, or between middle management and employees. In addition, objective scorecards ensure a consolidation of the top-down and bottom-up strategy management and execution efforts (see Figure 2). Conclusion: Dashboards are highly customizable, interactive, tactical components of a BPM solution, the face of BPM today. Scorecards focus on strategy management in a more structured approach. Many factors combine to make the timing right for Business Performance Management software. Evaluating strengths and weaknesses of each business unit or department will help organizations identify and prioritize performance strategies. At times, the CEO may drive organizational change in order to align business units and communicate the strategy in a timely and cost-effective manner. In other cases, change can be triggered by a CFO who wants to improve the budgeting and planning cycle, a CIO who wants to have an integrated business performance management solution that reduces maintenance costs and provides high ROI, or by other executives who need to have insight into the metrics and performance of the organization. One approach to understanding business performance management adoption and organizational requirements can direct us to leverage existing capability maturity models as defined by SEI [see 3] or by the AMR Enterprise Performance Management maturity models [see 4] with their operating, integrating, optimizing, and innovating stages. These models are used by organizations to identify best practices, and to increase the maturity of their processes from short-term to long-term, sustainable, cost-cutting measures. Research into Hyperion�s current client base has helped us categorize organizations into three groups based on their size and adoption of dashboards and scorecards. These three categories tie into and could be reviewed in conjunction with the maturity models mentioned earlier, as part of an integrated, long-term initiative of implementing a business performance management solution. Further segmentation can be performed on the client base related to not only the number of employees, but also profit margins and industry, but this is beyond the scope of this article. 1. Information Insight and Transparency - The first step in managing an organization is to understand current status and performance. Corporate leaders are looking for reporting tools to help them review and analyze the amount of available data and bring relevant information to their attention. When the champion of a BI (dashboarding) implementation is at the department level, or if the organization has fewer than 500 employees, the time spent communicating the strategy is fairly small and cannot be reduced enough to significantly impact deliverables. On the other hand, dashboards providing the latest performance results can help decision makers react to unexpected business and market changes. Users can make informed decisions quickly using reports and dashboards containing historical information. Information is available on-demand, interactive, and consistent. 2. Building the Strategy - How can corporate leaders ensure the organization is aware of the long-term strategic goals? There are organizations with a culture of strategy management, and these organizations simply need an enabler for their process. The strategy management process can be sustained by strategy management applications that help users articulate the strategy and goals, communicate these across the enterprise, and monitor key performance indicators using recognized scorecarding methodologies and industry benchmarks. The software must offer complete strategy - and accountability- mapping capabilities, as well as Web-based scorecards, message boards, forums, and discussion threads. Execute the strategic plan or get the boot, Reality of Growth Guide No. 1, Deloitte Touche Tohmatsu, 2004. 3. Repeatable Process - How can executives ensure that all business units are aligned? How can they ensure continuity and strategy execution? Large organizations with thousands of employees can not continue using the traditional management practices. They must adapt their practices to current market and competitive pressures. These organizations spend a considerable amount of time communicating the strategy and aligning corporate vision and goals to daily actions and initiatives. Today, a BPM software solution integrates business and financial management applications with broad reporting and analysis functionality. With an integrated solution, users can ensure that the deliverables in the organization are aligned, the budgets are tied to the strategic and operational goals, and information is available to all decision makers with a unified point of view through dashboards and scorecards. For an integrated solution, users will define the strategy, tie it to the planning and budgeting cycle, refine the targets, and create scorecards based on actuals and forecasts. All the real-time data will be consolidated into a user-defined view as part of a dashboard (see Figure 3). Ultimately tying the strategy management system to an established dashboarding solution will give users the benefits of having real-time business data, as well as strategic performance results in a comprehensive, easy-to-use interface. As organizations evolve, their software requirements progress as well. From the three categories described earlier, we have seen organizations evolve from an initial dashboarding solution to a combined implementation, including dashboards and scorecards (see Figure 4). In those cases, a strategy management system using scorecards gives users the framework for improving their capability to deliver on the strategy, with pre-defined perspectives, communication and collaboration tools, and a strong tie into accountability. Some organizations take a holistic view for implementing business performance management, that is, different components of the solution can be implemented separately and integrated when ready for deployment. In this case, users typically start by perfecting their planning and budgeting cycle and making the results available for strategic planning. These organizations typically require a software solution that maps into the planning and budgeting cycle and uses a highly integrated, collaborative planning process that also aligns corporate strategy with individual objectives and detailed plans. A combined solution enables companies to have a clear understanding of corporate strategy, objectives, and accountability while proactively monitoring actions and performance against company targets and industry bench-marks. Long-term financial planning can be linked to strategic objectives and operational targets for profit maximization. Conclusion: Using scorecards can help an organization overcome the challenges in executing current strategy. In addition, many organizations recognize the benefits of performance management applications, adopting them enterprise-wide to stay, or to emerge, in the top ranks of their industry. They use them to create increased value for shareholders and new services and products for the customers. 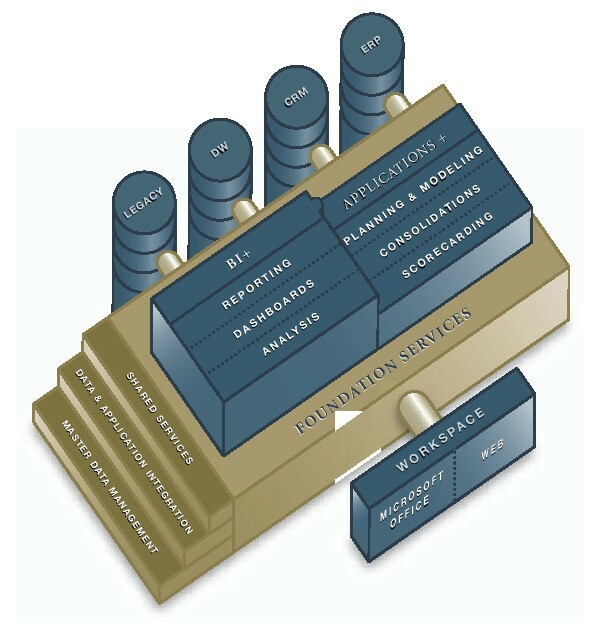 We have reviewed how organizations can adopt different components of a BPM solution based on their business needs. Users can begin at the point of their most immediate performance management challenges, then grow into fuller BPM solutions according to their needs and budgets. This multi-national organization has a culture of strategy management and information transparency. It started the implementation of the BPM solution by improving the planning, budgeting, and reporting processes. While the implementations were in progress, other initiatives were taking place as well. The organization, having an entrenched culture of strategy management, started implementations of strategy management systems at each business unit level. Scorecards focused on middle management, while the consolidations for corporate were made through a dashboard. Overall, the IT department had a critical role in the implementation, standardizing on a single business performance management platform, interacting with all the systems in the organization, and providing managers with up-to-date information from all aspects of the organization. Small- to medium-size organizations use software applications to monitor performance and to support project management and performance monitoring processes rather than communicating the goals through strategy and cause-and-effect maps. Large organizations with thousands of employees, such as community banks, cannot continue using traditional management practices. They must adapt these practices to current market and competitive pressures. These organizations spend a considerable amount of time communicating the strategy and aligning corporate vision, to branch objectives and daily actions and initiatives. This particular organization had problems delivering within the guidelines of the budget, and there was no accountability on the financial targets set. Change control and accountability were critical to them. Many organizations have problems with accountability, or siloed deliverables, or overall problems delivering on the strategy. In those cases, a strategy management system gives users the framework for improving their capability to deliver on the strategy, with pre-defined perspectives, communication and collaboration tools, and strong ties into accountability and budgets through scorecards. A strategy management system can instantly communicate any changes in strategy to the entire organization, support accountability, and reduce execution time and costs, while still achieving defined performance targets. In some implementations we have seen 40% reduction in labor hours. This community bank started their BPM implementation by improving their planning and budgeting process, coupled with a strong change management process driven by BI technology. To tie all the aspects of the BPM solution into one interface, this organization has implemented a detailed reporting component. Dashboards are highly customizable, designed to access and analyze the latest business dynamics. They provide users with a wealth of analysis options, such as root-cause analysis, guided navigation, and visual triggers, options that weren�t available when static reports were the primary decision tools. Dynamic tools are necessary to respond to short-term market changes, supporting tactical decisions. Dashboards can contain the exact same information as a scorecard, but the difference is in the business knowledge and processes. If building strategy management information into a dashboard, the investment is on the implementation designers� side, where a simple link into a strategy management system can provide all the functionality required. Dashboards can be simple information providers, or they can become the face of an executive management system, linking into specialized applications for financial and strategy management. From a different perspective, scorecards display key performance indicators as they relate to a strategy management process supporting alignment, accountability, and execution. They summarize the enormous amount of business information into key indicators necessary when making long-term decisions. Simply having a mission statement in everyone�s office is just the beginning for delivering on the strategy; having a culture of change and execution, requires enablers and the processes and tools to support it. That is what scorecards, as part of a strategy management system, provide. A complete, integrated solution will give you the features to manage your organization today and for the future. Dashboards, as the media for any type of business information and scorecards and as part of a strategy management system, provide a comprehensive decision analysis and management reporting system. They are the primary vehicles for communicating performance within an organization (see Figure 5). Word processing software was introduced to improve employee performance, and it has become an integral tool for every business. In much the same way, dashboards and scorecards will become the tools successful business leaders use to improve business performance management and strategy execution. Andrea Vasiliu is a marketing manager for Hyperion, the global provider of business performance management. She joined Hyperion in 1994 and was responsible for defining, managing and developing various BPM solutions, including scorecard, business modeling and activity-based management. She is currently creating the strategy, vision and product roadmap for the company's performance scorecarding application, as well as defining the role of strategy managment within the new generation of integrated BPM applications. She can be reached at andreea_vasiliu@hyperion.com. Mark Conway (Mark_Conway@hyperion.com), Director, Hyperion Academic Alliance Program, provided permission to publish and archive this article at DSSResources.COM on December 28, 2005. Courtesy of Hyperion Solutions Corporation. A version of the article was published in a DM Direct Special Report, April 4, 2006 Issue, at http://www.dmreview.com/article_sub.cfm?articleId=1051851. This article was posted at DSSResources.COM on April 30, 2006.